Dog friendly home decor by Arianna Belle. Photo by Frame Your Pet. Graphic design by Pretty Fluffy. Before Christmas, Pretty Fluffy -an Australian blog that's the ultimate guide for the true dog lover- asked me to photograph the stylish home of Arianna Belle to complement her new article about how you can be a dog owner and still have a beautiful home at the same time. Here's the gorgeous and bright living room of Arianna Belle. Little Foot likes to be where the sun shines! Little Foot on the couch. The pillows behind are Arianna's designs. Arianna Belle is a young luxury pillow designer based in Los Angeles, California. She is also well known for adorning the homes of style savvy home decor specialists around the world. She is the proud owner of Little Foot, a 5 year old Maltipoo who has been part of their family since he was an 8 week old puppy. Little Foot and Arianna having a great time! 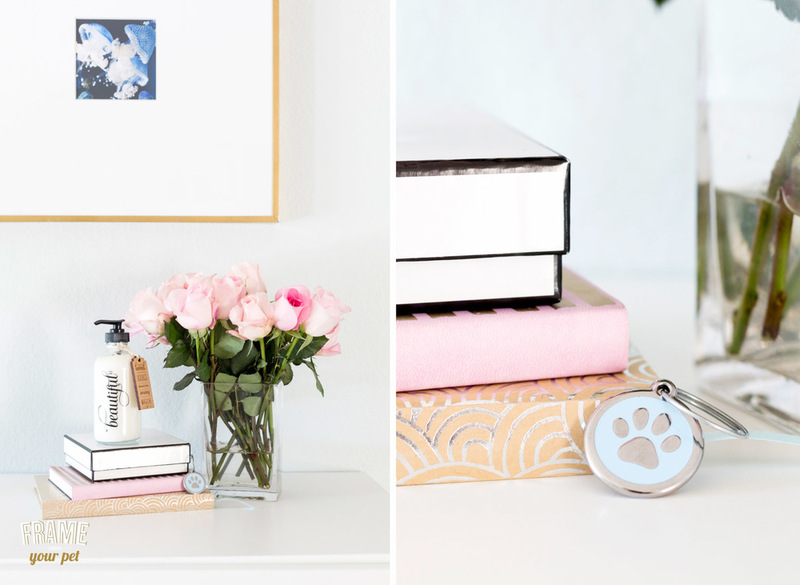 In this article that Serena Faber from Pretty Fluffy wrote, you will get to know more about this amazing young designer and how she turned regular home accessories into pet friendly items. For example, this magazine holder which they keep next to the sofa for easy access during evening playtime with Little Foot. As you can see, the beauty of her designs is brought to her home decor. Like many other entrepreneurs, she works from home. Look how Arianna Belle easily turned an ordinary corner into a beautiful home office. As you can appreciate, is not about the space! Left: a corner turned into a home office. Right: details of things you can find in her desktop. Little Foot is Arianna's daily inspiration. Right: close up of the dinning room's wall. At Arianna's home, all details are very well taken care of. Here are some of my favorite photos from the session. Which one is your favorite? Keep things simple and color cohesive. If you are an entrepreneur and you are looking for professional photos to promote your business or website, contact me. I'd love to work with you!